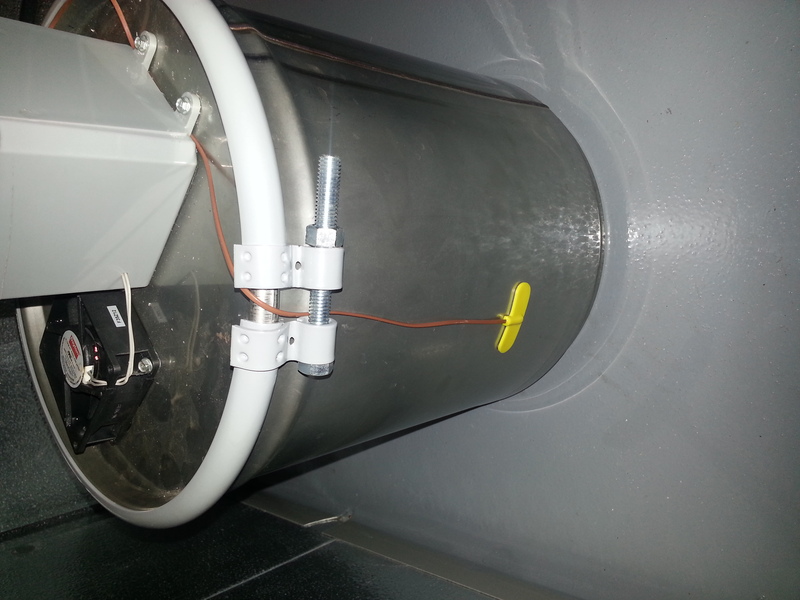 This project turns a 5 gallon bucket into a high capacity, automatic fill humidifier. ** This system should always be connected to a ground fault circuit interrupt (GFCI) circuit to prevent injury when a fault to ground occurs. All electrical wiring should conform with national and local code. Components should be enclosed in appropriate boxes to prevent exposure to water and personnel. PREFERRED - (1) 5 gallon stainless steel pail ($143 new), The Cary Store #26BSS6. Some folks have found the enamel coated pails above rust fairly quickly with high levels of humidifier use. A stainless pail is expensive, but will last longer without rusting. PREFERRED - (1) 500 Watt adhesive heating pad - http://www.ebay.com/itm/like/272081763622?lpid=82&chn=ps&ul_noapp=true - These are preferred since they can be mounted on the outside of the pail preventing immersion of the electric heater in water and avoiding a ground fault and shock hazard path. (1) 1150 Watt heating element – Side mount deicing heater ($63.00) – McMaster-Carr # 3583K91. Alternative: You could probably use the heating element from an electric tea kettle or other hot water heating device for less cost. We used a simple, but more expensive approach for the prototype, which allowed for keeping all electrical connections out of water and at the top of the bucket. ($30.00) - from Radio Shack. More air flow (higher CFM) would allow for even greater humdification capacity (see calculation section), but we sized this for the 4-5 gal evap range. This allows daily checks on the level and function of the prototype in long periods of operation, is quiet, and uses less electricity. (1) float valve, like a toilet tank fill valve ($7.00) - from Home Depot. The toilet fill valve is reliable, inexpensive and has the right form for use in this vertical humidifier. Some pipe strapping was used to secure it in place against the lid. (1) PID control – Allows tuned control of the heater based on setpoint temperature of the water. Seek a PID control with an autotune function (e.g. the TA series from MYPIN), an alarm option and an easy to read display. Also take care to check the output voltage and current limits, the SSR noted in the bill of materials is intended to allow a low current PID output control a larger load. 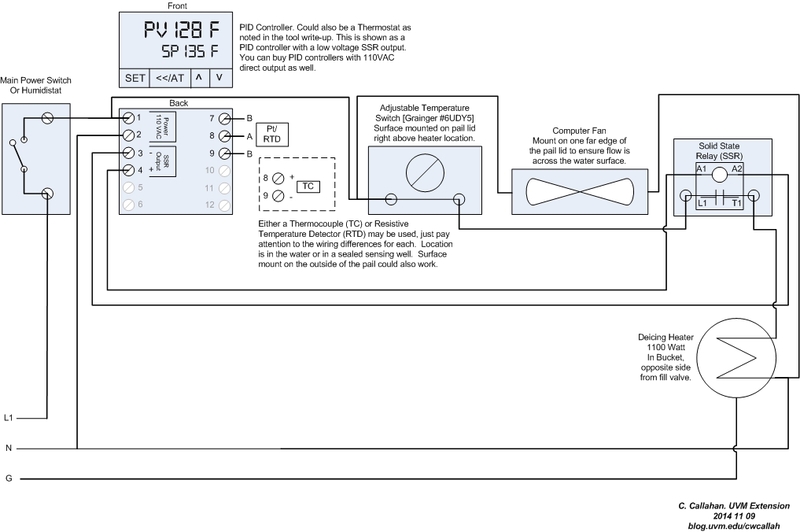 The manuals for the MYPIN / AGPTek TA & TD Series PID controllers can be hard to find online. The TA series manual is available here and the TD series manual is available here. (1) 25 A Solid State Relay – An alternative way of controlling a high power circuit (load) using low power input (coil). The nice thing about solid state relays (SSR) compared to conventional coil / magnet relays is that they are quiet and less prone to arcing, burning and spot-welding closed. You may be able to do the temperature control using a thermostat/aquastat. 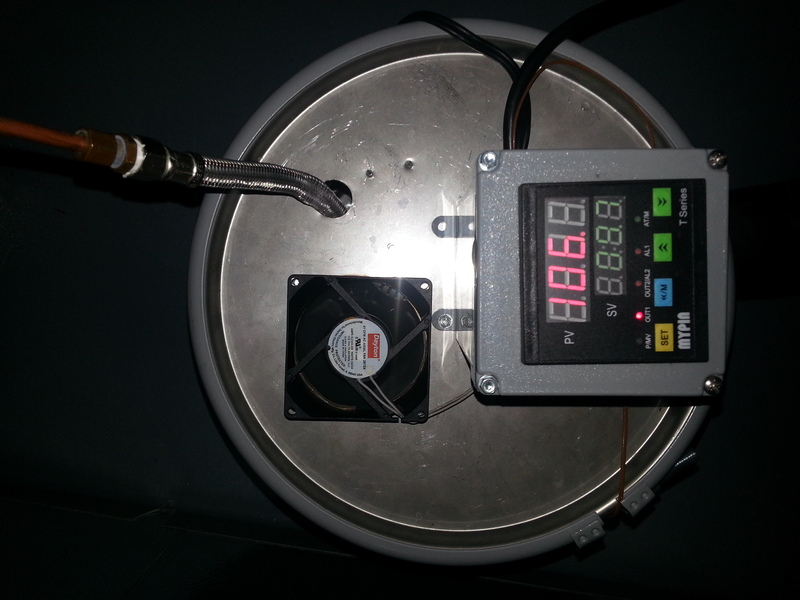 I used a PID controller as I wanted to prove the function of the humidifier with precise water temperature control. In other words, I wanted to be sure my math was correct in practice, and needed steady water temperature to do that. A thermostat would likely result in a wider swing of temperature which could be just fine in practice. Heating the water to slightly above the dew point of the target air temperature and relative humidity (RH) conditions will provide a source of humidity that will self regulate at the proper target conditions. This design was arrived at after trying several humidifiers on the market and finding they tend to result in poor humidification control and lead to an abundance of condensation or liquid water droplets which may be unwanted in crop storage and food processing / aging applications. We landed on a heated reservoir approach since it ensures the water being added to the air is in vapor phase. Alternative approaches (centrifugal and ultrasonic humidifiers) emit droplets of water into the air which then need to be evaporated to result in increased humidity. We favor the direct injection of water vapor via evaporation which this design provides. A five gallon bucket was chosen as the reservoir since they are generally and widely available and since 5 gallons will provide a reasonable reservoir even if the automatic fill function is not incorporated. A plastic bucket was used in a first prototype by some melting was noted and we moved to a steel bucket as noted in the bill of materials. An electric heater is controlled by the PID controller (or perhaps a thermostat) which determines the water temperature and switches the output accordingly. A one thousand (1000) watt heater was originally specified for the prototype since they are widely available and this heater will bring 5 gallons (41.5 lbs) of cold (50 degF) water to a reasonable holding temperature (130 degF) relatively quickly (about 45 minutes). The maintenance heat duty required (due to evaporation of water into the air) depends on the air flow and the incoming conditions, but it will generally be lower than this initial heating duty. 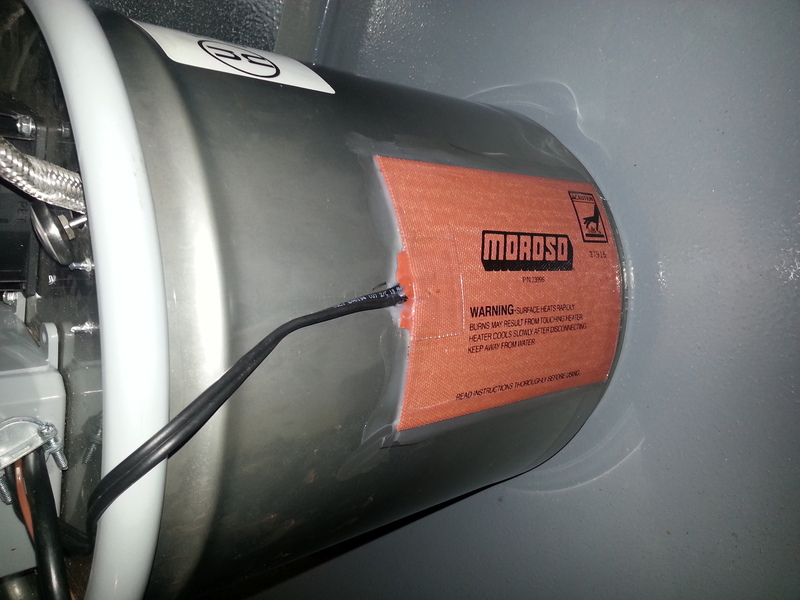 Later builds have used a 500 Watt adhesive silicone heater which can be adhered to the outside of the pail, brings the water to temp in a reasonable amount of time and avoids the immersion of the heater in water. In the case of target conditions of 80 degF and 90 %RH (dew point of 76.8 degF), a humidifier reservoir of 90 degF saturating the 30 CFM airflow completely (i.e. dew point of 90 degF) will result in 1.4 lb/hr of water evaporation into the air. This works out to about 4 gal of water per 24 hour period, with an average heating duty of 411 watts. These conditions are reasonable sizing conditions for a meat curing application. For vegetable storage, let's consider potatoes at 35 degF and 98% RH (dew point of 34.5 degF). Keeping the water at 110 degF will result in about 0.45 lbs/hr (1.3 gal per 24 hours) of water evaporation requiring 131 watts of heating duty on average. The rate of humidification you need can be quite variable and hard to pin down. It depends, fundamentally, on where the water vapor is actually going. In other words, why do you need to humidify. Most times, the vapor is escaping from the room with air just through leakage (infiltration or exfiltration.) At times, water vapor may be condensing out of the air at cold surfaces (like moisture that appears on a glass of ice water on a humid day.) If you know roughly how much water you’re putting into the space to maintain conditions presently (e.g., water on a concrete floor, filling a non-auto-fill humidifier, etc.) you can have a very good estimate of what your load is. Otherwise, some trial and error will be required using this system by adjusting the temperature setting on the humidifier to match the necessary evaporation rate for your system. You can estimate the amount of evaporation from a warm water surface using the following formula, which I borrowed from EngineeringToolbox.com. I have made a spreadsheet that uses this formula to estimate the rate of humidification. It can be downloaded here.. Note that this spreadsheet includes a macro in order to solve for wet-bulb temperature given dry-bulb temperature and RH. So if prompted, you’ll have to allow macros to run. Sparging (sending the air through the water, like bubbling) can be accomplished with a blower instead of a fan. Or careful ducting of the air with some extension plumbing from the fan outlet could do the same function. Testing will determine if this is necessary. It is important to remember that fans are intended for low pressure, high flow applications and blowers may become necessary if too much back pressure is imposed on the humidifier due to additional plumbing or sparging. Similarly, outlet plumbing/ducting could be included to better distribute and throw the humidified air away from the humidifier. A piece of PVC piping with a cap and some small holes drilled into it might be one way. In its simplest form, however, this humidifier consists of just the fan mounted on the bucket lid and some holes drilled in the same lid on the opposite side for outlets. There is also a thermal switch included in the design as a safety precaution. ** This system should always be connected to a ground fault circuit interrupt (GFCI) circuit to prevent injury when a fault to ground occurs. All electrical wiring should conform with national and local code. I wanted to include the PID tuning that has worked well for me. This is based on a MYPIN T-series PID controller. Many people have trouble navigating the various menus and the manual for the MYPIN PID Controllers. Here is a set of simplfied instructions that should help. Press the blue "((/M" or "((/AT" button to enter the Parameter Setting Mode. The actual label depends on the model of PID Controller. The last digit of the setting should blink indicating you are in Parameter Setting Mode. Press the blue "((/M" or "((/AT" button to move to other digits. Use the green"^" or "v" buttons to adjust the digit's value as need. Press the yellow "SET" button to finalize the adjustment. Adjusting High Limit, Low Limit, Hysteresis, Decimal Point, and Security / Password. Press the "v" or "^" button for more than 5 seconds. Menu items: LSP, USP, HY1, HY2, dP, ScY. Scroll through these by pressing the SET button. Adjust with "v" and "^". Adjusting Factory Settings (Including input sensor type and PID tuning settings). Press and hold SET for more than 3 seconds. Menu options: AL1, AL1mode, AL2, AL2mode, PvF, InP, P, I, d, oUd, HYS, CtL, Pc, Cdb, C_t, C-F, LcK. SCroll through these by pressing SET. Adjust with "v" and "^".